Lainey Feingold will be speaking three times in San Diego during the week of February 27 at the Manchester Grand Hyatt, site of the 32nd annual CSUN Assistive Technology Conference. Join Lainey for a quick book party, her ever-popular legal update session, and a free accessibility panel before the official start of the conference, all described here. To match the fast pace of the CSUN Assistive Technology Conference, Lainey Feingold will hold a lightning book event after the first full day of conference events. 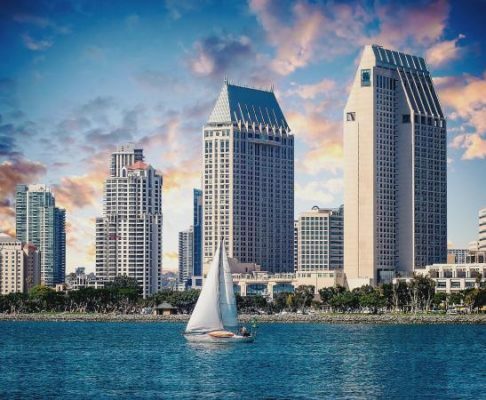 Join her in The Deque Presentation Room (Seaport Ballroom F) at the Manchester Grand Hyatt in San Diego, California from 5:15 – 6:00 on Wednesday March 1 to hear stories from her book, Structured Negotiation, A Winning Alternative to Lawsuits. Structured Negotiation has been used for 20 years to improve digital access with some of the largest companies in the United States, including Bank of America, Major League Baseball, and Anthem, Inc. — companies who became accessibility champions! Structured Negotiation is an alternative to lawsuits, allowing for win-win solutions and relationship-building. The method avoids the excessive conflict and run away costs too common when a case is filed. The one-and-only CSUN conference, a gathering thousands of people from around the globe who care about digital accessibility and accessible technology, is a perfect place for a Structured Negotiation book event. Lainey has been presenting at the conference for over fifteen years, and many themes in the book overlap accessibility themes central to the conference. The CSUN conference even makes a cameo appearance in the book. Come find out why. Light refreshments provided by Deque Systems, the digital accessibility company that graciously offered a place to hold this event. In addition to the book party, Lainey will be doing the 2017 Digital Accessibility Legal Update with Linda Dardarian on Wednesday, March 1 at 9:00 a.m. This session, which Lainey has done for many years, always draws an enthusiastic crowd eager to hear about the latest legal developments in the accessibility space. Will there be any news from a federal administration hostile to civil rights? What are advocates doing to expand and protect the right to access digital content? Did Section 508 actually get refreshed, or was it caught in the post-inauguration freeze that shuttered other regulations? Come find out! On Tuesday February 28, the day before the first full day of the CSUN Conference, Lainey will be participating in a free event sponsored by digital accessibility company SSB Bart Group. Lainey will join the Panel Discussion on Trends in Accessibility Legislation & Litigation. The panel is part of SSB’s Accessibility Summit. Note: This panel is not at the CSUN conference hotel. It is at the Embassy Suites hotel next door, in the Monterey Ballroom. Looking forward to seeing so many friends and colleagues in San Diego! This post announces that Lainey Feingold will have a book event in San Diego during the CSUN conference. The party will be held on Wednesday March 1. the time is 5:15 – 6:00. Join Lainey if you can. She will also be speaking about the law affecting disabled people’s right to access websites and other digital content. The law might change with the new federal administration. Come find out. Lainey will also speak the day before the conference starts on a panel about legal developments.